Qvidian is a popular proposal management & automation software. From content and RFP management to proposal management and sales operations control, Qvidian allows teams to access, develop, manage and deliver sales content. Its real-time advisory services allow teams to stay focused on the end goal that needs to be won and on the agile methodologies that need to be adopted for sustainable sales figures. The Qvidian comes as a wholesome software solution with tools and mentors who guide through the process of creating winning documents that are cohesive and compatible with the goals. The proposal automation software is highly configurable, so that all users can apply it for their sales processes and proposals and make changes when required. Basically, every proposal will be customized to meet the requirements of your client. 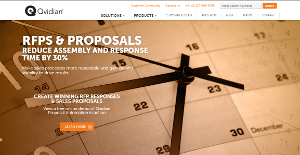 Qvidian offers many proposal management service benefits to its users. To start with, it is a cloud-based service which means that you can access it through your desktop and mobile devices, eliminating the need for installing it or undergoing any lengthy process. Proposals drafted through Qvidian are client focused, which means that the documents are prepared using the data and details that work with the customers. The content integrated into such documents is approved by Word and PowerPoint which helps create consistent proposals, presentations, contracts and PFP responses. It is also compatible with the Salesforce CRM, which means that data can be pulled out and merged into the database of Qvidian it necessary. The workflow is automated, and less time is spent merging data from different documents. For any type of sales operations, it is important to have good directory or RFP generated responses as many leads turn into prospects through this way. Through Qvidian, a repository of questions and answers is uploaded as in an effort to automate the process of RFP responses. In addition to these, Qvidian also offers advisory, technical and management services through its teams of experts and mentors. If you are interested in Qvidian it could also be a good idea to examine other subcategories of Best Sales Proposal Automation Software gathered in our base of B2B software reviews. It's crucial to keep in mind that almost no service in the Sales Proposal Automation Software category will be an ideal solution able to match all the goals of various business types, sizes and industries. It may be a good idea to read a few Qvidian reviews first as some solutions can dominate only in a really small set of applications or be created with a really specific type of industry in mind. Others may work with an intention of being simple and intuitive and therefore lack complicated functions welcomed by more experienced users. You can also come across software that cater to a broad group of users and give you a complex feature set, but this in most cases comes at a higher cost of such a solution. Make sure you're aware of your requirements so that you select a service that offers all the functionalities you search for. How Much Does Qvidian Cost? We realize that when you make a decision to buy Sales Proposal Automation Software it’s important not only to see how experts evaluate it in their reviews, but also to find out if the real people and companies that buy it are actually satisfied with the product. That’s why we’ve created our behavior-based Customer Satisfaction Algorithm™ that gathers customer reviews, comments and Qvidian reviews across a wide range of social media sites. The data is then presented in an easy to digest form showing how many people had positive and negative experience with Qvidian. With that information at hand you should be equipped to make an informed buying decision that you won’t regret. What are Qvidian pricing details? What integrations are available for Qvidian?